Perennials are the backbone of the flower garden. Unlike annuals, which need to be replaced each year, perennials go dormant over the winter and emerge again in spring. Many perennials will live for decades, among them peonies, daylilies, and hostas. Others live for only a few seasons and must be replaced every few years. Because they need to store up energy to return and bloom again, most perennials have shorter blooming seasons than annuals. Typically, they flower for only three to four weeks, sometimes less and sometimes more, and offer foliage and perhaps seedpods as interest for the rest of the growing season. However, when many perennials are used together in the garden—such as in beds or borders—the progression of different plants in bloom from spring though summer to fall can provide a fascinating array of combinations of colors, textures, and habits. NANCY'S BOOK IS AVAILABLE FROM AMAZON.COM. Spent flowers can be cut off as soon as flowering has finished, to prevent the plant from expending energy forming seed instead of growing more roots or stems. Cutting off spent flowers is called deadheading, and it also helps keep the garden looking neat and trim, and may encourage rebloom in some varieties. The plant itself should be allowed to grow until most of the stems and leaves have yellowed, usually after a hard frost in fall. Cut the plant down close to the ground; if there is a small mound of foliage at the base of the plant, allow that to remain. Some years ago Liz Ball wrote the following article about how to decide if a perennial is really what they call a "better plant". This is an article more for gardeners than for yardeners but for anyone interested in perennials it is a wonderful article. Perennials for All Reasons: Better Plants for Your Home Landscape. Whether you are a beginning gardener or an experienced one, choosing perennial plants for your garden can be a somewhat daunting experience. While everyone buys a new perennial plant from time to time to fill in a space or just to indulge the irresistible urge to try the one everyone is talking about, there are times when we make significant perennial purchases. These are when we start a new garden or when we renovate an existing perennial bed or border. It really helps the choosing to develop a set of criteria that represent what you value in a plant. After all, perennials are usually considerably more expensive than the jaunty little annual plants that we buy in flats or market packs and stick in the ground here and there to brighten the yard. Perennials are sold in individual containers, typically quart sized or larger. To make any kind of show, gardening books recommend planting several plants, clusters of three or five--even seven plants if the plants are small or you have a large space--so whatever you choose represents a significant financial investment. Unlike annuals which are disposable when frost arrives, perennials have staying power. A perennial ornamental plant will presumably be around year after year, gradually spreading and settling in for the long term. So the pressure is on to make a good choice. It is difficult to narrow down the hundreds of choices available in the colorful mailorder catalogs or at the nursery or garden center. It is tempting to choose the very latest, trendy or rare plant that everyone is talking about. Logic suggests that if it is all that unusual, how can it be a reliable, easy care choice ? However, at such times the heart often rules, unless we have deliberately thought about the qualities that we want in our ornamental perennials. How can gardeners tell which would be a good plant for their particular garden? Which ones have the qualities that we value? What we all are looking for is what horticulturists call a “better plant”. In their efforts to breed and develop plants that will sell widely and thus make them money, professional growers constantly seek out promising plants, ones that they think have more desirable qualities than existing ones. They also constantly attempt to improve existing ones, breeding new varieties of old standbys. As they seek to improve a plant, breeders assume that their definition of a “better” plant is the same as a gardener’s. And in many cases it is. Breeders value perennials that are sturdy stemmed, colorful, long-blooming, have attractive foliage and are adaptable to a variety of growing conditions. In fact, the running joke is that the perfect perennial would be one that blooms all summer like an annual, does not need deadheading or staking, has no pests and can handle both sun and shade, drought and wet. A plant labeled an award winner is likely to be a good choice. New introductions of both annuals and perennials are constantly evaluated against their existing counterparts to determine if they are truly “better”. Various organizations and plant societies conduct trials of groups of plants in test gardens in different parts of the country to put the plants through their paces. If their performance truly is superior to the others, then they are designated winners. All America Selections (AAS), a non-profit, educational organization, has been doing this since 1933. They trial a wide variety of flowers and vegetables grown from seed at 33 different locations in the US and Canada. Home gardeners find that varieties designated as AAS winners have greater disease resistance, earlier bloom, new and improved colors and other qualities superior to those of their type already available at nurseries and garden centers. 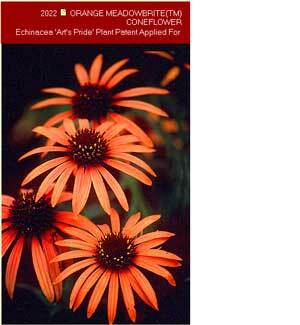 The Perennial Plant Association has announced winning plants since 1983. Recently they chose Perovskia, or Russian Sage, their Plant of the Year for 1995. The 1996 choice is Penstemon digitalis ‘Huskers Red’. Similarly, the Herb Society has recently named Beebalm (Monarda didyma) as Herb of the year for 1996. Award winners are only one way to judge whether a plant may be a “better” plant. Sometimes the best indication that a plant is a good choice is how popular it is in gardens. The Perennial Plant Association tracks sales of various perennials in regions around the country and they have discovered that there is a consensus among gardeners on the top 10 perennial plants that has changed very little in 10 years. [See sidebar for list]. While hosta may shift from first to third place over the years, it consistently places high in the estimation of gardeners. So do daylily, coreopsis and the others. If they are this popular they must be reliable performers, thus, “better” plants. However, the true test of whether a perennial is a “better” plant for your garden is the one you conduct. While the qualities that growers and evaluator organizations look for in a plant that makes it superior to others of its kind are probably the same ones you would value, they do not take into account the special circumstances that exist in every garden and the particular qualities that an individual gardener is seeking in a plant. So when you choose your plants do not rely entirely on award labels or national popularity. Develop your own criteria for what you want in a plant. What would be the “better” plant for you? Because you live in a particular horticultural zone, obviously a perennial would have to be hardy in that zone. While zone numbers reflect cold hardiness, bear in mind that plants have varying heat hardiness too. Just because it can handle the winter cold in Georgia, it does not necessarily follow that a plant can handle the summer heat there. In your particular yard there are microclimates--sheltered areas that are warmer, exposed areas that are cooler, pockets where frost lingers, where soil is more alkaline, or that are perpetually boggy or shady. When choosing plants for each of these areas, keep microclimates in mind. It is easier to (alter)the plant choice than the growing conditions, especially if low maintenance is one of your criteria for a better plant. A plant that is in the wrong place suffers stress. A better plant may hang on, rather than die, but its struggle will make it vulnerable to pests and disease and it will not perform up to its capability. It will no longer be “better”. Pay attention to the several varieties available for many of the most popular and reliable perennials. Notice that the award winners are typically specific varieties of a particular plant. That does not mean that any variety of that plant is “better”. While a certain hosta variety may be fantastic in one region, another variety may be better suited to your area. If you already have a garden, you have been conducting your own unofficial trials to determine the better plants for your yard all along. No doubt, some of the plants in your garden have proven to be eminently satisfactory, sticking with you through thick and thin, drought and disaster. They are obviously better plants for you. Take a moment and think about which plants that are already out there in the garden are your favorites. Write them down in the chart that accompanies this article and list why they are your favorites. The list of plants probably will include those very plants that have stuck with you so dependably. Chances are the list of reasons why you love them will include the qualities that you most value in a plant. They probably include easy care, long bloom, beautiful flower shape and color, pest resistance and other virtues. Do not be surprised if they are also the same plants that friends and neighbors love and have success with, the same ones you see in gardens all over the area. That is no coincidence. There is a reason that you see Rudbeckia fulgida ‘Goldsturm’ (Black-eyed Susan) or Stella d’ Oro daylily everywhere. These are truly better plants. They perform reliably under a variety of conditions with minimum care. Do not pooh-pooh them just because they seem to be common--even ubiquitous--and therefore ordinary. Can I grow shrubs and/or perennials in a container? Certainly – just keep in mind that perennials may not bloom the first year, and shrubs may take two or three years to start flowering. Also, if they are being grown in an area where temperatures dip below freezing for extended periods, the pots will have to be moved under cover for the winter; we recommend storing them in a cold but frost free area, in dim light; with occasional attention to watering. Annuals will provide almost instant color, and there is no need to worry about over wintering them, so they are usually a better choice for a container in colder climates.